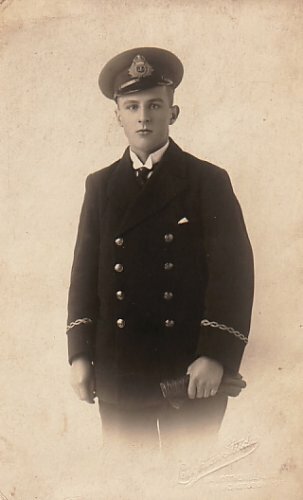 David OXSPRING joined the Merchant Navy at an early age. During the second World War he agreed to serve under the Royal Navy as a Merchant Navy Auxilliary Radio Officer. He sadly went down on the MANISTEE, an Ocean boarding vessel (R, 5,368t, 1920) which was sunk by U-boat torpedo,in the N Atlantic, 24th Feb 1941. The U-boat in question was U-107 commanded by Admiral Doenitz's son-in-law, Lieutnant Gunter Hessler, who went on to become Kriegsmarine U-boat arm's Chief-of-Staff, after winning the Knight's Cross for his exploits off the West African coast. I was advised to look at Photo No 240 on your web site by Prof. Brian Cotton, Chairman of the Radio Officers Association. As archivist for the ROA, I have a list of all ROs killed in WW1 and 2. Here is copy of what I sent to Brian for your information. have looked at picture and I think it is more likely that it was taken in 1917 instead of 1916. If David left school at 16 and did say 6 - 9 months training he would have been about 17 when photo was taken prior to sea duty. Have looked up Memorial Register and David Oxspring was on T124 articles on the Elder and Fyffes cargo-liner Manistee when it got clobbered. She was HMS Manistee having been requisitioned by the Admiralty as an Ocean Boarding Vessel. She was 5,360 tons and sunk on 24th Feb 1941, torpedoed by U-107 and by an Italian submarine Bianchi. Sank in position 59.30N 21.00W. Two other ROs died, Samuel Gillan Kidson (30) and Edwin McCann (3rd RO and no age given) Both Oxspring and Kidson are listed as 1st ROs. I don't know if this is a typing error but it doesn't look like it. A bit strange to have two 1st ROs. I see Wirkworth is in Derbyshire, so it is possible Oxspring trained in Manchester. I'll see if I can find him in Exam records when I get back from Austria. No dob for Oxspring given in memorial register. I hope this information will be of interest. In Memory of/ DAVID OXSPRING/ Radio Officer/ 944612/ H.M.S. Manistee, Naval Auxiliary Personnel (M.N. )/ who died on/ Monday, 24th February 1941. Age 41./ Additional Information: Son of David and Helena Oxspring; husband of Catharine Barclay Oxspring. Commemorative Information/ Memorial: LIVERPOOL NAVAL MEMORIAL, Lancashire, United Kingdom/ Panel Number: Panel 16, Column 2. Historical Information: It was impossible during the war for the Navy to man all the auxiliary ships that served with it. Accordingly early in the war a manning depot was established at Liverpool for dealing with those men of the Merchant Navy who agreed to serve with the Royal Navy under the terms of what was known as a T.124 agreement, and became subject to Naval discipline while generally retaining their Merchant Navy rates of pay and other conditions. They served in various types of auxiliary vessels, at first mainly in armed merchant cruisers, but also in armed boarding vessels, cable ships, rescue tugs, and others on special service. The maximum number of T.124 officers and men exceeded 13,000. Among ships a large proportion of whose complement belonged to this service, the "Rawalpindi" and the "Jervis Bay" won unique renown from the circumstances of their end; but men from over 120 ships are commemorated on the memorial which it was decided to erect at Liverpool. The great majority of Merchant Navy men, who did not serve with the Navy, but with merchant ships, are commemorated on the Merchant Navy Memorial, on Tower Hill, London. This memorial was unveiled by the Admiral of the Fleet, The Viscount Cunningham of Hyndhope, K.T., G.C.B., O.M., D.S.O., on the 12th November 1952. In Memory of/ Radio Officer DAVID OXSPRING/ H.M.S. Manistee, Naval Auxiliary Personnel (M.N. )/ who died aged 41 on Monday, 24th February 1941. Radio Officer OXSPRING was the son of David and Helena Oxspring; husband of Catharine Barclay Oxspring. Remembered with honour/ LIVERPOOL NAVAL MEMORIAL, Lancashire, United Kingdom.